The Lessard-Sams Outdoor Heritage Council recently issued its request for 2017-‘18 funding proposals. The grants are for projects that protect, restore and enhance wetlands, prairies, forests, and habitat. The council expects about $100 million to be available for projects starting July 1, 2017. The council may revise this estimate after November 2016. Submissions are due May 26, 2016 and must be done electronically. Council staff are available to assist applicants. For help with writing proposals, contact Sandy Smith by email or phone at 651-297-7141 to set up an appointment. The minimum request is $400,000. Lower requests should go to the Conservation Partners Legacy Program. The council makes annual recommendations to the Minnesota Legislature on appropriations from the Outdoor Heritage Council, which is funded by the Clean Water, Land and Legacy Amendment. The Clean Water Partnership (CWP) program continues to accept applications from local governmental units interested in loan funding to lead a nonpoint source pollution control project for protection or restoration of Minnesota’s water bodies. Applications can be made at any time and more than $9 million is available. The Clean Water Partnership Loan Program Request for Proposals (RFP) and other details can be found on the CWP website. The application and related information will be accepted through an email address listed in the RFP. Reports on protecting and restoring the Root River watershed are now open for public comment. This area in southeastern Minnesota provides high quality streams for trout fishing and other recreation. However, some parts of streams suffer from bacteria levels that may make the water unsafe for swimming, soil and sediment that cloud the water, and nitrate levels that may stress aquatic life like fish. The MPCA is accepting comments on the reports through May 16. The first report is on the Total Maximum Daily Load (TMDL) study that identifies pollutants in the Root River and tributaries, determines the reductions needed, and recommends actions to take like planting cover crops and reducing runoff. The second report outlines Watershed Restoration and Protection Strategies (WRAPS) for the Root River to restore and protect the streams such as planting buffers of deep-rooted plants. This area of Minnesota is vulnerable to pollution because of its karst landscape. In karst, only a thin layer of soil covers the porous bedrock underneath and allows pollutants on the land to easily reach groundwater used for drinking. In a karst landscape, where caves and sinkholes are common, streams and groundwater mix as water moves through the bedrock. Because of karst, there are no lakes in this watershed. Many groups are participating in restoration and protection efforts, including the Fillmore Soil and Water Conservation District, the newly formed non-profit group Friends of the Root River, cities in the watershed, and several state and local organizations. Individuals are always encouraged to get involved. For more information on Root River studies or to submit written comments, contact Shaina Keseley, MPCA project manager (email Shaina.keseley@state.mn.us, phone 507-206-2622). Comments, which must be in writing, are due by 4:30 p.m. on May 16. The comments must specify which report you are commenting on, include a statement of your interest in the report, and the action you wish the MPCA to take, including specific references to sections of the draft report you believe should be changed and the reasons for making those changes. Buffers are important for clean water and healthy aquatic life, according to an MPCA analysis of water monitoring and buffer sites across Minnesota. Agency scientists examined the quality of buffers next to and upstream of more than 3,500 fish monitoring sites and 3,000 macroinvertebrate (bug) monitoring sites throughout the state to see if buffers really make a difference to water quality. The scientists focused on biology because that reflects conditions of water quality over time. 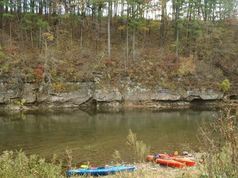 Buffer quality was measured by calculating the percentage of the buffer area that was undisturbed by human activities. The data analysis clearly shows that buffers are important for clean water and healthy aquatic life (fish and bugs). And that the greater the percentage of stream channel that is buffered upstream of a monitoring site, the better the health of the aquatic life. Watersheds with missing or disturbed buffers have less healthy fish and bug communities. Scientists compared the buffer quality to the health of the fish and invertebrate communities at each site. The sites were grouped into “excellent,” “good,” “fair,” “poor,” and “very poor” categories based on the health of the biological community. See the buffer analysis on the MPCA website, including photos and charts for four example sites in the Lower Minnesota, Zumbro, Blue Earth and Sauk River watersheds. 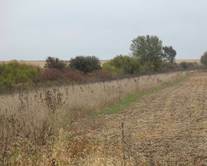 Photo above is County Ditch 13A in the Lower Minnesota watershed where the buffer zone is in poor condition and the in-stream habitat is severely degraded in the upstream watershed along with the fish and bug communities. The State of Minnesota has launched a new web portal dedicated to Minnesota’s permitting process for PolyMet’s proposed NorthMet mining project at www.mn.gov/polymet. This project is complex and will need permits from several state agencies in order to proceed. The web portal provides basic permitting information and directs users to agency websites with more detail. PolyMet Mining Corp. is proposing to develop a mine and processing plant to extract copper, nickel, and precious metals from the NorthMet Deposit in northeastern Minnesota. PolyMet’s proposed NorthMet project would be located in the St. Louis River watershed on the eastern end of the Mesabi Iron Range, about 6 miles south of Babbitt and 1 mile south of the existing Northshore (iron ore) Mine. Processing of the ore would take place at the former LTV taconite plant near Hoyt Lakes. The total project area would include a new open pit mine, temporary and permanent waste rock disposal areas, recommissioning of an existing processing plant and tailings basin, and refurbishment of an existing 7-mile railroad and utilities corridor between the mine and plant sites. You can sign up on the portal to receive email updates on the NorthMet project as it continues into the permitting process. Minnesota Gov. Mark Dayton has proclaimed April 18-April 22 as Water Action Week. With many Minnesotans planning events on Earth Day April 22, Dayton is encouraging action all week to protect and restore the state’s water resources. The governor will be visiting classrooms and water treatment facilities to highlight his call for an ethic of clean water practices. This is a great time for local partners to call attention to the work they do every day for Minnesota’s water resources. The MPCA thanks all the SWCDs, watershed groups, cities and counties for their input, support and programs to protect and restore water resources. On the mend: Burandt Lake in Carver County - A TMDL study leads to a project to decrease phosphorus in this lake southwest of the metro area. WRAPS: Part of a healthy diet for lakes and streams - Statewide efforts to check the health of lakes and streams are coming to fruition this year with “prescriptions” for healthy waters expected in more than two dozen watersheds. Minnesota wastewater plants keeping much more 'P” out rivers and streams - Communities and industries continue to do their part to d'crease phosphorus that causes algae in lakes and streams. Since 2000, Minnesota wastewater treatment facilities have decreased the amount of phosphorus in their discharges to surface waters by 71%, from 1,855 metric tons per year to 544 metric tons, according to the 2016 Pollution Report to the Legislature. The Minnesota Pollution Control Agency (MPCA) is seeking volunteers for its Citizen Stream and Citizen Lake Monitoring Programs. Program volunteers track water clarity, which helps the MPCA learn more about a lake or stream’s water quality. “Thirty years ago, when I started monitoring Long Lost Lake, I thought it would be an interesting thing to do for a summer. Little did I know that I would still be at it three decades later. I guess you could say I’m hooked,” says Jim Svobodny, volunteer (photo at right). The MPCA uses data collected by Jim and other volunteers to determine whether water quality is improving or declining in specific water bodies or watersheds. Identifying these trends is one of the first steps in protecting or improving water quality throughout the state. As part of the program, volunteers are asked to perform a short and simple water clarity test at their favorite lake or stream, once per week throughout the summer. Equipment and training are provided by the MPCA and no prior experience is necessary. For some lakes and streams, volunteer-collected data is the only data available, making citizen involvement critical to ensuring the lasting health of Minnesota’s waters. Find out if your favorite lake or stream needs monitoring by using the MPCA’s online interactive map. The BWSR Board will review draft policy and guidance for the buffer program at its June 2016 Board meeting. The Soil Loss program will undergo rulemaking in the fall. 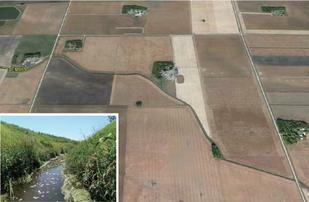 For information, visit the DNR Buffer Mapping Project website. Information and comments on buffer and soil loss program implementation will be accepted until 4:30 p.m. on May 4, 2016. Comments may be submitted via email to buffers.bwsr@state.mn.us or via U.S. mail to David Weirens, Asst. Director for Programs and Policy, BWSR, 520 Lafayette Road, St. Paul, MN 55155. Pharmaceuticals, pesticides, industrial effluents, and personal care products are some of the contaminants of emerging concern in drinking water. The Minnesota Dept. of Health will hold a forum to gather stakeholder feedback on contaminants of emerging concern in drinking water on Tuesday, May 3, from 8 a.m. to noon, at the Wilder Foundation in St. Paul. The program will include information on special projects, financial support from the health department, and discussion of future work on contaminants of emerging concern. If planning on attending, please RSVP to health.legacy@state.mn.us. The MPCA publishes the Waterfront Bulletin as an email-based newsletter featuring updates on watershed funding, projects, events and research throughout Minnesota. Waterfront is published to share information with internal MPCA staff and external watershed partners. If you have a story to share, please contact MPCA Public Information Officer Cathy Rofshus at the email or phone number listed below. Subscribe to WaterFront via Email Alerts, available at www.pca.state.mn.us/waterfront.